How many trips do you think it would take to get a million people to Mars, as per Elons goal? Ok, terrific. People will be around to call you out when you are wrong. Better start making excuses now. When did Elon say that he wanted to take a million people to Mars? Or do you not understand that a significant percentage of his planned million person colony would would be born on Mars instead of transported there? He estimated that the first colonists could begin setting out in a decade, and said it would take between 40 and 100 years to ship enough people over to Mars to populate a city. I've got to agree there, but personally, I think that any idea of moving millions off-planet is simply science fiction and in my opinion, just isn't going to happen. That is unless some other form of propulsion than chemical rockets is developed. Ionic propulsion has a far better "Specific Impulse" than chemical rockets, but as yet nothing can approach the chemical rockets for the brute force thrust needed for vertical launch. The most we might see is "seed colonies" of maybe hundreds, but that's so far in the future, that it may as well be science fiction. Let's see if self-sufficient colonies on say, the moon, can work first, though there are probably more resources on Mars. Maybe, I'm not far-sighted enough. As for the earth, either the population is controlled voluntarily or it will happen catastrophically, either way, I won't be here. I dont think we humans will colonise space in an orderly fashion. First we get cheap launches to space, this is the biggest step. This allows for tourism, and larger cheap satellites. As a result of this, we may end up with space hotels and lot more satellites in space. Suddenly you need services, such as commercial water and food refining/ recycling depots in space which requires more people up there, but is cheaper than launching new stuff up every time. Maybe there forms a business case to service satellites, this requires more people. Someone figures out how to refine mined resources up there, more people. Before you know it, there are hundreds - thousands of people up there, just doing day to day stuff. This is all without colonisation efforts. a) a business case to send people there. b) once there people are there (Moon, Mars or anywhere) they need to be able to sustain themselves without constantly drawing resources from earth, within a few years (20 or so) of arriving. I think both conditions are not too far away. Colonisation on earth happened for the same reasons. Dont talk about the EM Drive, I was prepared to suspend my believe in Physics for that thing. It betrayed us all. The only way to actually build a space elevator is to already have the thousands of tonnes of material up in space, and then to lower it down to earth. I dont think we will see anything like this soon . . . or ever . . ? I dont think we will see anything like this soon . . . or ever . . ? Meh. That's what they said about the cruise basselope. Launch a satellite with enough carbon fiber cable and a small rocket engine. Once in geosynchronous orbit, the rocket engine leaves the satellite with carbon fiber attached and flies toward earth. Once it reaches earth fasten it to a platform and mount your elevator to it. Easy peasy. That's fine. What's your opinion on water vapor. Liquid-fuel rockets emit almost entirely CO2 (carbon dioxide) and H2O (water). Water vapor is an effective greenhouse gas, yet, you seem to ignore it. Depending on the type of fuel (for example solid) it uses chlorine which is devastating to Ozone, and kerosene exhaust forms nitric oxide and nitrogen dioxide, both of which react with ozone in the atmosphere. Isn't that kinda a big part of the difference between a rocket and a jet? Rockets bring their own oxidizer instead of using air, so abundance (or lack) of atmospheric oxygen doesn't affect the chemical reaction at all. By the time we are done with all the 'tests' we will have no resources left for the real thing. Lol. We aren't going to use up all the kerosene and available oxygen in test flights. Not by a long shot. There were a lot of things done in the 18th and 19th centuries that, in retrospect, do not seem like such good things now, like widespread acceptance of chattel slavery. Not to mention that, even today, it would be a bit more expensive and complicated to send someone to Mars than it was to transport someone to Australia from England 200 years ago. For one thing, they didn't have to carry the oxygen they needed, and it was already known that crops, livestock, and available resources could make the colony self-sustaining. Do you have any evidence at all that these tests will use up all of our resources or are you just blindly speculating? Cursing Elon, gimme a break. We are laughing at you and the Elon fanboys. 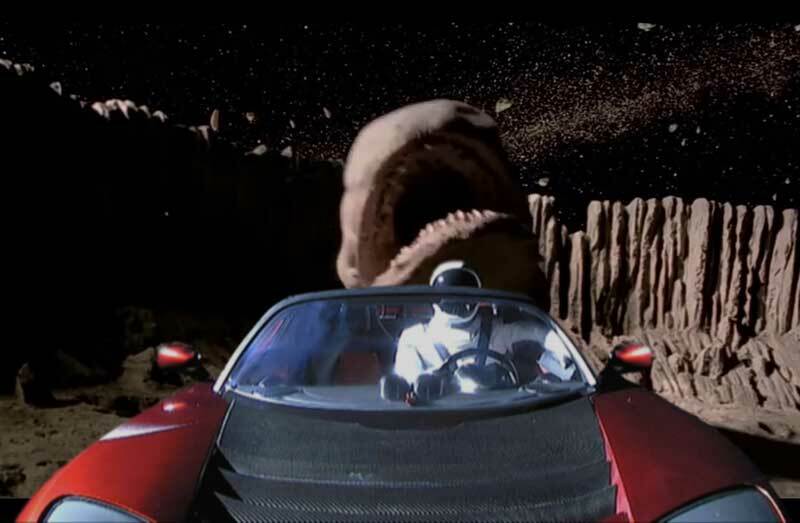 I think is funny that you boys believe that his Tesla is flying in space. You are so brainwashed that you believe anything NASA tells you, and now you believe Elon. It is pitiful and funny at the same time. You're famous, Hoppy! Vice quoted you in an article called Flat Earthers Are Pissed at Elon Musk last week, I didn't see any mention of it on the forums yet. I bet his mother is very proud. John Davis should resign and let hoppy take over. Go, hoppy! You are now the poster boy of the movement! The issue is, once we have the technology and space ship/s that can launch the amount of carbon nano-tubes material into space, we probably wont need a space elevator. The mass of the cable will be in the 1000's of metric tones. And last I checked (could be wrong) but carbon nano-tubes are just barely strong enough to handle the gravitational pull over the 35 000km required. I dont know why the out right criticism for him pointing out pollution and limited resources? Every human activity uses up resources, even sitting on your arse on these forums. The great thing about space is, if we do it right, eventually we will be able to utilise the resources in our solar system. There is a lot more stuff up there than down here, and not endangered pandas are going to mind us mining it up there. As for pollution. That is again an issue with all human activities. Over its a net cost/reward issue that is worth discussing. There are users in the forum pushing back on the Flat Earthers, who are then disparaged by the true believers as “muskbots.” Like all online activity, most of the threads quickly turn into flame wars. Wow thanks (not) for linking to an article where superficiality reached a whole new level..
Will you stop spamming this forum with links that have absolutely zero content ? And will you stop spamming this forum with posts that have totally negative content? You complain about my "redicule" yet your main argument all along has been ridicule, with your stupid talk of "NASA fan-boy" or "Unbelievable that anyone really believes this spacy trash is real......." for anyone that doesn't agree with your ideas. But, I still find it strange that this new-fangled flat earth theory can't explain the simplest of observations like even the movement of the sun. All you have is your silly negativism of trying to disprove space travel, which really is totally irrelevant. I am not sure which is worse, faked space flight, or round Earth. This forum appears more anti-NASA than flat Earth. The article contained plenty of content, taken directly from the mouths of you flat earthers! I promise you, one day you will wake up, and realize how insane you sound! That's all dutchy bothers about. He thinks that destroying NASA will suddenly make the earth flat. That bothers me too but who is there to debate any "standard flat earth" theory? Very few actually. I spend some time here once every few months. This time round I can definitely see a drop of Flat Earth responses. Very few questions are posted in the Q&A page, this should be an indication that the movement is losing supporters. That should be where new comers go. Instead we have a few strong supporters of Flat Earth. Its entertainment value is failing, I hope a new celebrity says something about the flat earth again soon. He did link the article. What did you think the blue text in his post was?